Houses & Homes VA: May was a GREAT month for the housing market! May was a GREAT month for the housing market! We all need to hear some good news once in a while and if you are in any way involved with the real estate market than this is for you! According to the National Association of Realtors (NAR) the entire country experienced a strong increase in home sales last month as compared to April. In addition sales for May were 5.1% higher than May of last year and the average selling price country wide was $213,400. Although the first quarter of this year was not as good as was hoped for these latest figures reflect the highest monthly rise since August of 2011 (which was 5.5%) and that is great news for sellers as well as the economy in general. Buyers are also benefiting from the fact that rising inventory levels are resulting in slower price growth making now a good time to buy. In addition to these factors the job market in the U.S. has shown improvement and there has been a recent decline in mortgage rates. Another strong indication that the market is steadily improving is the fact that short sales and foreclosures have declined considerably since last year. This May only 11% of total sales were comprised of “distressed” properties as compared to 18% in May of 2103. On average short sale properties sold at 11% below market value while foreclosures averaged 18% below the norm. Part of the reason is that many foreclosures are cash deals and this can often make a difference in the selling price. As I had written about in a recent blog post now is a good time for first time home buyers to take advantage of lower interest rates and increased inventory. 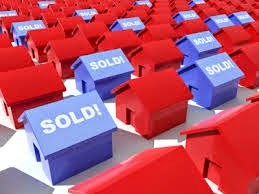 Although only 27% of home buyers in May represented first time buyers this is also expected to improve in future months. The average time that homes were on the market in May was 47 days and the specific breakdown is as follows: Short sales remained on the market for 125 days, foreclosures averaged 57 days and non-distressed homes sold in an average of 44 days. The best news here is that 41% of homes for sale were on the market for less than 1 month. That’s something that should excite anyone considering the sale of their home! In the Southern region sales increased an average of 5.7% in May with an average selling price of $184,800. The Western region of the U.S. rose 0.9% at an average price of $297, 500. While this is the least increase in all of the regions it is still an 8.4% increase as compared to May of 2013. In the Midwest home sales increased an impressive 8.7% with an average selling price of $165,900. Whether you are buying or selling now is a good time to get moving!